Getting closer to point "Writing-Burn-Down-Zero"
My new day job that I started earlier this year comes with a longer commute on the train. Time effectively spent with writing on my current book, a science fiction thriller romp with a lot of “citations” from classics such as “Invasion of the Body Snatchers”, “The Terminator”, or “Independence Day”. The writing process for me comes in several stages. Ideation and plotting are the core creative parts, fleshing out the story from a one liner (“A bunch of stranded aliens try to steal back their spaceship from US military”) to a fifty chapter structure. After that it’s writing. The most challenging part. Will the story idea hold up to hundred-thousand words? Will the characters be interesting enough to hold the reader’s attention for such a long time? Will all the plot-lines play out as sketched out? Let me explain “Writing Burn Down Zero”: Burn down is my take on agile project methodology, adapted for writing. The fifty-plus chapter cards are my task repository, writing one after another — not necessarily in chapter order — is like developing a piece of software. One function point after another, each chapter stands on its own, with own drama and cast of characters, reactive or active, and with a small cliff hanger at the end. And the long list of chapters slowly burns down like a candle, two steps forward, one step back , putting flesh to the bare bone, creating life. “Burn Down Zero” for my latest story approaches fast, I am running out of things to write, that moment when my burn down list will be empty. All chapters will be there. The story is there. All the characters are in. All stories within the story are resolved. I’ve made it this far! 3 Things You Didn't Know About My Book "Teen Vampire Hunters"
The inspiration for Aunt Louise was Margaret Rutherford, the 60ies Miss Marple actress. Originally she was supposed to snoop alongside the kids, but after I had included Dan and Tiff into the story, things became too crowded, so she remained a supporting player. The solution to the cellar mystery (open / closed casket) came as one of the very last story pieces. Usually I go more prepared into a storyline, especially for such a crucial bit. There simply seemed no solution at first. Risky, to build the story first and then solve the how-done-it But I dodged that bullet successfully in the end. And maybe a good time to remind you guys out there: the Teen Monster Hunter prequel “The Test” is available on Wattpad as a free read! 2018 is almost over and 2019 knocks at my door. 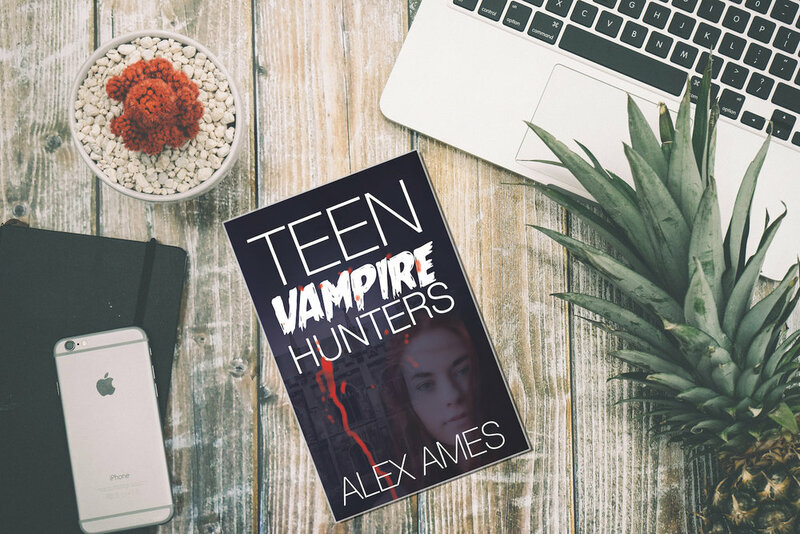 I managed to publish my usual two books, the German version of Teen Monster Hunters and the English follow-up Teen Vampire Hunters. Which is good, I guess. Sales-wise the monthly checks came in from my various publishing platforms, but definitely not with the numbers I’d like to see. It remains an inner struggle to spend time with non-writing activities. Maybe I should heed a friend’s advice and hire someone to run social campaigns to extend my readership. The second route in 2019 will be the conventional publisher route. I have 11 full size books under my belt, have the basic handiwork of a writer, and the discipline to deliver on time. My current project is aimed at a broader thriller scifi horror audience and hopefully an agent or publishing house will be interested. On a personal level, there are also big changes ahead. I am switching jobs, leaving behind a lot of very nice colleagues. The new job is a bit cloak and dagger, so I will not elaborate. I might need to establish a sort of topical firewall to separate truth from believable fiction when writing crime and spy stories. And so it goes… 2018. Thanks for the memories. Good riddance to lost opportunities. 2019, it’s in my hands to do it better. Troubleshooter - the complete book for free! Had not tended to it for a while. A very long while. My bad. But now it continues. The complete first book of the Troubleshooter series on Wattpad. Chapters 18 & 19 are now out!